Coordination that showcases Christ is that which is done in submission to Christ. We come together under the umbrella of His authority, His purposes, and His design for His sake. A Body that’s submitted to Christ works together harmoniously. Like an orchestra with different shaped and uniquely sounding instruments, all come together in a coordinated way. Though each instrument can produce exceptional solo performances, the sound becomes fuller, bolder, and more dynamic when coordinated together. Of course, that takes submitting to the conductor’s lead, playing the same song, coordinating into one, their individual sounds to the notes and beat of that song. He’s the One to whom we are all ultimately accountable. Coordination needs to be about bringing all things under Christ. When it’s about Christ rather than human leaders, people are more likely to submit. Jesus, as Head of the Church, determines the purposes toward which we all work. He’s the One who gels us together (Eph. 4:15-16). 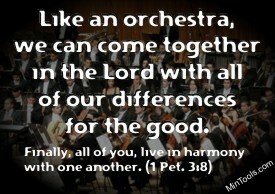 To come together in harmony, we need to follow the score He provides under His leadership. He’s the One who established the Church and designed it to function a certain way — like a body composed of many unique parts yet one under the direction of the brain. By His design, we should be functioning as a coordinated whole. Coordination To Showcase Christ: the fullness of him who fills everything in every way. When all of our individual parts come together in a coordinated way, we show more fully who He is. That’s what coordination in submission to Christ leads to. This entry was posted in Coordination.